Knit in LoveKnitting’s Paintbox Yarns Sock, this delightful cable and ribbed sock is quick to knit up and still hold interest. It can easily be knit without a cable needle and looks outstanding with speckled, striped, tonal, solid, and semi-solid yarns. 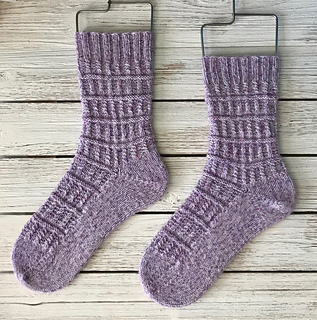 My testers had a lot of fun knitting this pair up! 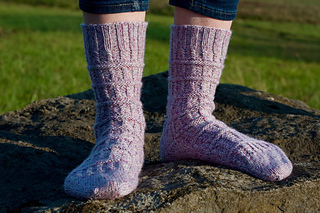 These socks are written for both cuff down and toe up construction and include written and charted instructions. Gauge is 8.5 stitches/inch on 2.25mm needles and it comes in three sizes.